Although the weather did not cooperate for this year’s Bash, the beans were tasty and there were many activities to enjoy throughout the event. A Friday night concert with the Mary Fagan Trio did perform although thunderstorms were forecast and was well received by those who attended. Here are some scenes from this year’s event. Planning will begin in the fall for next year’s Bash. If you would like to be a part of the committee or help in any way be sure to check out their Facebook page and website for additional information. 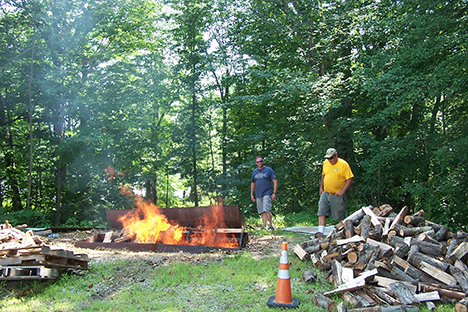 Starting the fire and keeping it at the right temperature for overnight baking takes lots of dry wood and tending over many hours before it is right for the bean pots.Volunteers were up past the midnight hour making sure that the coals were just right for great tasting beans many hours later. 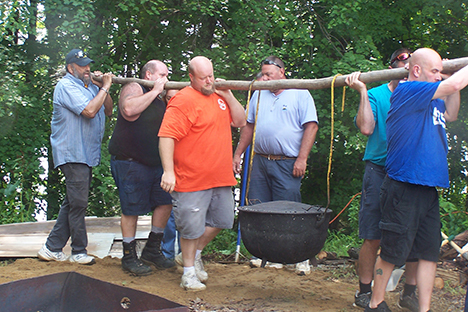 The traditional carrying of the beans requires many people working together to bring the heavy pot to the fire pit and to the tables for serving. 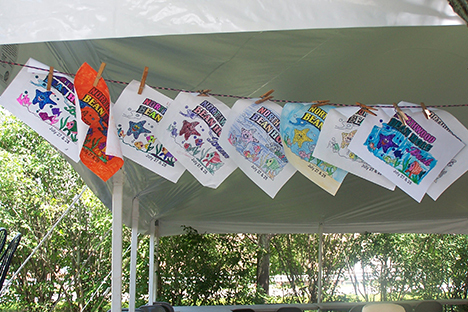 Drawings submitted by Northwood students for the coloring contest made an attractive and colorful display under the tent.